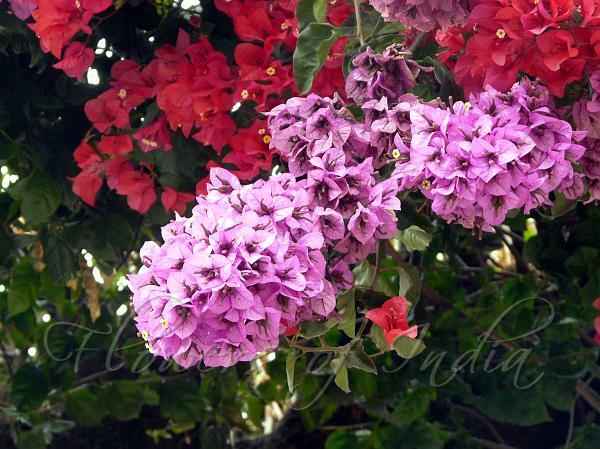 Named after Louis de Bougainvillea, a French navigator who came across it in Brazil during the 18th century, Bougainvillea has gained popularity all over the world, due to its versatility, richness and suitability to thrive in degrading environmental conditions. 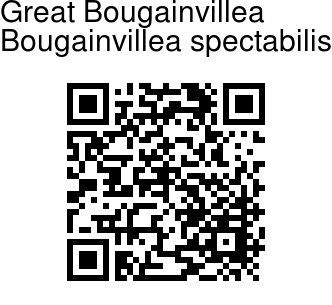 Great Bougainvillea is a spectacular species of Bougainvillea. It is a woody perennial vine, with stout spines. Leaves are alternate, simple, ovate to somewhat elliptic, up to 10 cm long. Flowers arise in leaf axils, in clusters of threes, each flower with a purple, red, pink, or orange bract beneath, up to 3-4 cm long. Sepal cup is tubular with 5 sepals, up to 2 cm long, tube the same color as the bracts, with white sepals, 3 mm long. Real petals are absent. Fruit is an achene, elongate, 5-ribbed.